A newspaper article about Reverend T. J. Nixon's speech for the Sanford High School Class of 1925 baccalaureate service. A Methodist minister, Rev. Nixon's speech focused on several Biblical stories, including: the story of Jesus of Nazareth feeding 5,000 people with five loaves of bread and two fishes, the story of Moses, and the story of King David. The article continues with the program for the closing ceremony of the high school graduation. Professor Herman F. Harris, of Rollins College, delivered the commencement address and diplomas to the students. In addition to this, there is a menu from the Junior-Senior banquet that took place on June 2, 1925, at the Women's Club. Original newspaper article, 1925: Sanford High School Collection, box 3A, folder Baccalaureate Service, item SCPS00157, UCF Public History Center, Sanford, Florida. Digital reproduction of original newspaper article, 1925. Sanford High School Collection, box 3A, folder Baccalaureate Service, UCF Public History Center, Sanford, Florida. Thrift, Charles Tinsley. The Trail of the Florida Circuit Rider: An Introduction to the Rise of Methodism in Middle and East Floridaa. Lakeland, Fla: Florida Southern College Press, 1944. 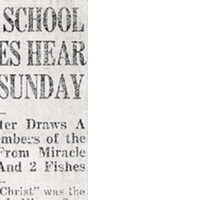 “Sanford School Graduates Hear Dr. Nixon Sunday: Methodist Minister Draws a Lesson for Members of the Senior Class from Miracle of 5 Loaves and 2 Fishes.” RICHES of Central Florida accessed April 25, 2019, https://richesmi.cah.ucf.edu/omeka/items/show/3888.